Ajit Pai, the new chairman of the FCC, has riled Internet activists who fear he’ll seek to reverse the agency’s Net neutrality rules. Less than a month after being sworn in, Donald Trump has begun to destroy the Internet. Well, at least that seems to be the opinion of multiple Internet activists and politicians. Ajit Pai, the new chairman of the Federal Communications Commission, has an avowed dislike of government regulation. 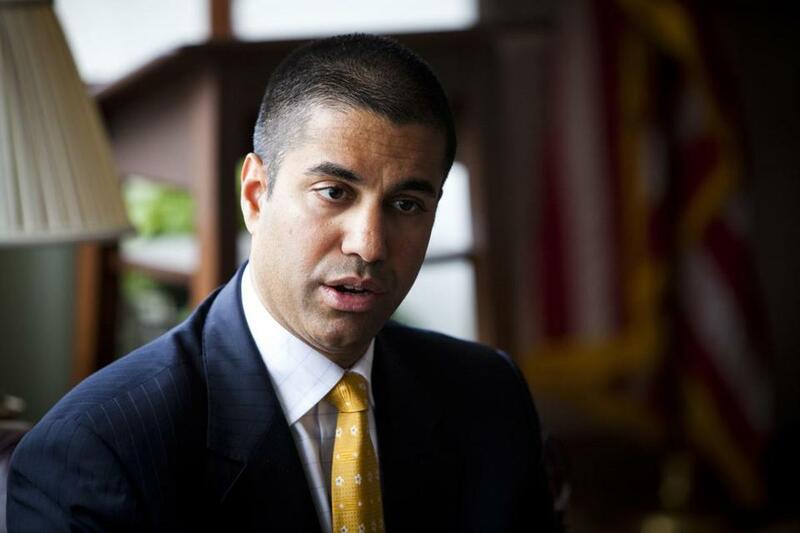 His critics fear Pai plans to reverse the FCC decision to regulate the Internet to ensure “Net neutrality,” the idea that Internet providers should treat all data alike. For two decades, the Internet got along with scarcely any regulation at all. Net neutrality activists then warned of online tyranny, with giant telecom companies such as Comcast Corp. crushing rivals by denying them Internet access. It hasn’t happened yet, and I doubt it ever will. Meanwhile, a raft of new broadband technologies, coming along over the next five to 10 years, may well solve the Net neutrality problem. But till then, the prospect of a deregulated Internet appalls Democratic US Senator Edward Markey of Massachusetts, who said Net neutrality rules have not been an obstacle to the industry. “Despite what the cable companies and Republicans say about Net neutrality, there is nothing broken that needs fixing,” Markey said Tuesday. Markey has a point. Despite dire warnings from free-market think tanks, I see no sign the FCC regulations have hampered online innovation or tanked telecom profits. But that argument works both ways. Two years ago, despite years of hand-wringing from Net neutrality activists, there was little evidence giant telecom companies were using their market power to crush their weaker rivals. For instance, Comcast owns the NBC television network and other video businesses. But the company didn’t block or slow down access to other video providers to give NBC shows a competitive edge. Yes, there was a big dust-up over Comcast charging extra fees to Netflix to handle the massive video traffic coming from Netflix to Comcast. But this was a dispute over network interconnection fees, a standard Internet feature, and not an attempt to stop people from watching Netflix. The Obama-era FCC studied the matter and decided not to intervene. Still, the big Internet providers, which have near-monopolies in many markets, could abuse their power. So why not pass a relatively simple law to ban specific abuses, like blocking and throttling data? Republicans in the Senate say they’re willing. But most Democrats prefer the FCC’s decision to regulate the Internet using a 1934 law originally written for phone companies. This law is so expansive that, in theory, it lets the FCC impose new taxes on the Internet, or regulate the prices charged by Internet providers. Outgoing FCC chairman Tim Wheeler had vowed the agency wouldn’t go that far. But some future administration might appoint FCC commissioners with very different views. For instance, Harvard law professor and Net neutrality advocate Susan Crawford likes the idea of Internet rate regulation. “The federal government should be requiring wholesale fiber networks to be available at reasonable prices throughout the country,” she told me. Crawford added that even if the agency didn’t actually set rates, the mere threat would keep Internet providers in line. I’d rather keep them in check through competition. Net neutrality is an issue because Comcast, Verizon Communications, and other major Internet providers often hold monopolies in the areas they serve. Would-be rivals can’t handle the stunning expense of building alternative networks. So what’s needed are radically cheaper ways to deliver broadband. And here they come. There’s 5G, a set of wireless technologies capable of beaming data through the air at up to 1 gigabit per second. Boston startup Starry Internet has said it will start deploying a 300-megabit 5G wireless service here this year, with plans to expand into 14 other US cities. Meanwhile, AT&T plans to start offering 5G Internet in Austin, Texas, and Minneapolis this year, as an alternative to the existing providers in those cities. There’s also hope for those with DSL Internet service carried over old-fashioned copper phone wires. DSL’s top speed — 10 megabits, if you’re lucky — hardly counts as high-speed Internet. But DSL could be supplanted in a few years by G.fast, a new technology that can run up to a gigabit per second. Because G.fast uses the same copper wires already found in millions of buildings, installation costs will be much lower than for running new loops of high-speed optical fiber. Last month, British Telecom started hooking up G.fast in 138,000 UK homes and businesses, at a top speed of 330 megabits. Its goal is 10 million connections by 2020. On this side of the Atlantic, tests of G.fast are just beginning. AT&T is trying it in Minneapolis, as well, in apartment buildings, and expects to deploy it in other cities this year. Another US carrier, CenturyLink, is testing G.fast in Wisconsin. Further into the future, another AT&T initiative, called AirGig, piggybacks on the electric wires already hanging between utility poles. AirGig transmitters beam radio signals that travel along the wires rather than through them, at multi-gigabit speeds. AirGig is years from commercial deployment, but AT&T plans to start field-testing the system this year. If these innovations pan out, we’ll see true broadband competition breaking out nationwide over the next decade. And then why would we need a Net neutrality law? When consumers can pick from two or three providers, none would dare push us around. In 10 years, we’ll probably still be arguing over the impact of Donald Trump. But as for Net neutrality, we’ll have trouble remembering what the fuss was about.